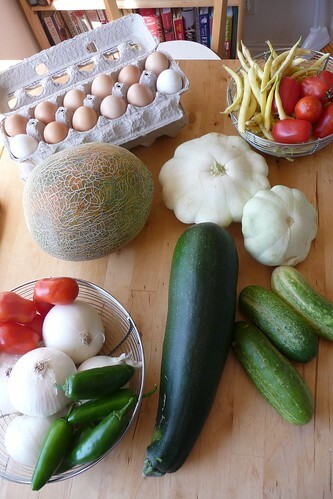 For less than $20, we got some fantastic white onions, jalapenos, ripe tomatoes, an Israeli melon, some cucumbers, a huge zucchini, two white patty pan squashes, yellow wax beans and two dozen eggs. 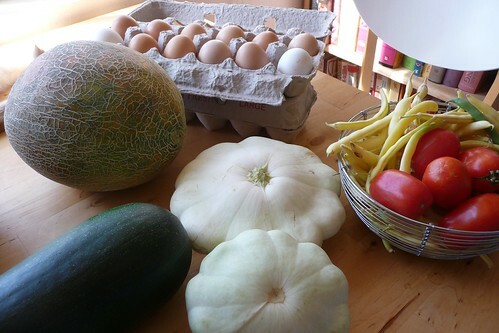 The farmer from whom we bought almost all of our veggies actually lives just a few blocks away from us. 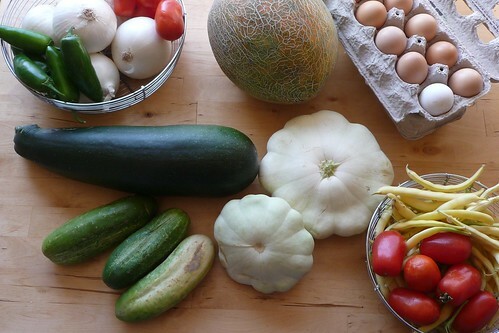 I found out that we can go to his house on Friday afternoons and get everything we could at the market, and even stop by his house Monday through Wednesday to ask for specifics. I plan to ask him whether he’s going to have chard and kale this year and when he actually starts selling. It’d be great if we could stop by and pick up munchies earlier than August! He didn’t have the Armenian cucumbers today, sadly, but I have hopes that if we go to his house on Friday, we can still get one. Lucky find of the day: A 1 franc coin from 1974 in our change! This entry was posted in local, untranslated, vegetable. Bookmark the permalink. Looking forwar to reading what you’ll do with that huge zucchini. I picked one about that size from my garden the other day. I can definitely say this: It was delicious!